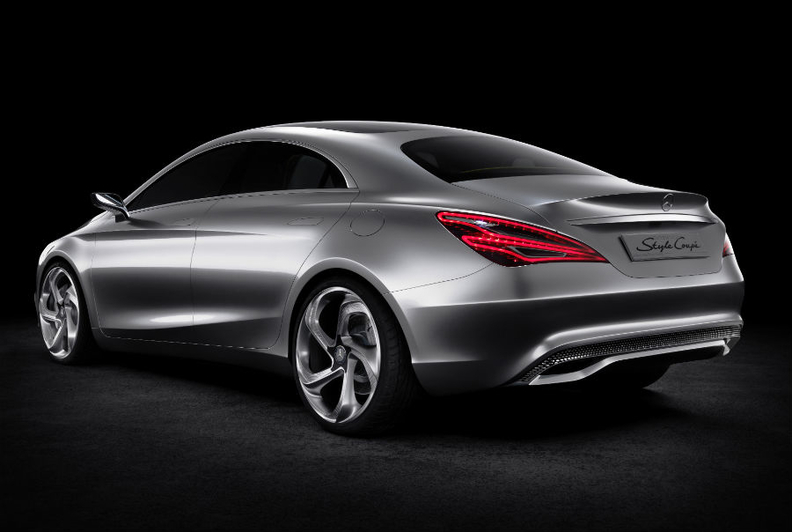 The Concept Style Coupe, pictured, previews the CLA ahead of its launch in 2013. Mercedes-Benz will preview its new CLA premium compact car by unveiling a concept called the Concept Style Coupe at the upcoming Beijing auto show. "This is the model against which sporty vehicles in the executive [compact] segment will have to measure themselves in future," said Mercedes CEO Dieter Zetsche in a statement. Mercedes design boss Gorden Wagener said the concept is almost production-standard and its sinewy fluid surfaces and sculptural lines "are the physical expression of our dynamic design idiom." A production version of the concept will go on sale in 2013 in global markets including Europe and the United States, joining the new Mercedes A class and B class as the third model built on Mercedes' new compact platform. The rakish four-door, coupe-styled sedan has been dubbed the 'baby CLS' after the larger CLS car launched by the German premium brand in 2004. 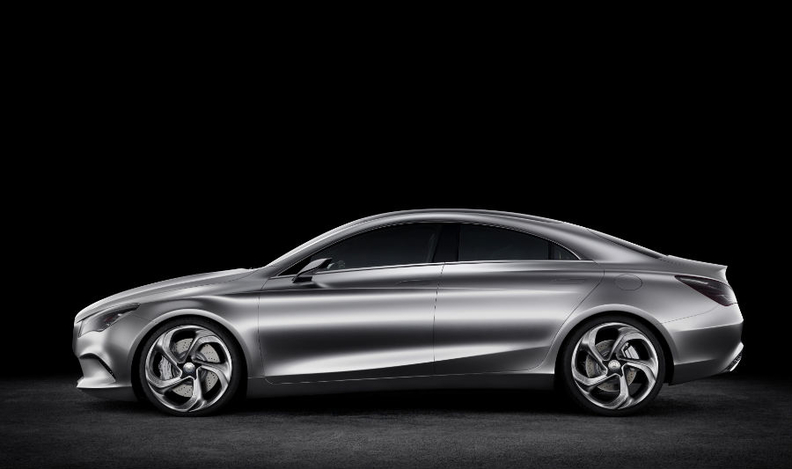 The compact platform, called Mercedes Frontwheel Architecture (MFA,) will eventually produce five separate models. The final two haven't been announced, but reports suggest they will be a small SUV and a shooting-brake-styled station wagon. The Concept Style Coupe is powered by a 211-hp 2.0-liter turbocharged gasoline engine that was first revealed in the new A class at the Geneva show last month. Power is sent to all four wheels via a seven-speed dual-clutch transmission. The car will be built alongside the B class at Mercedes' new $1 billion factory in Kecskemet, Hungary, which started production last month. The factory has an annual capacity of 100,000 units. 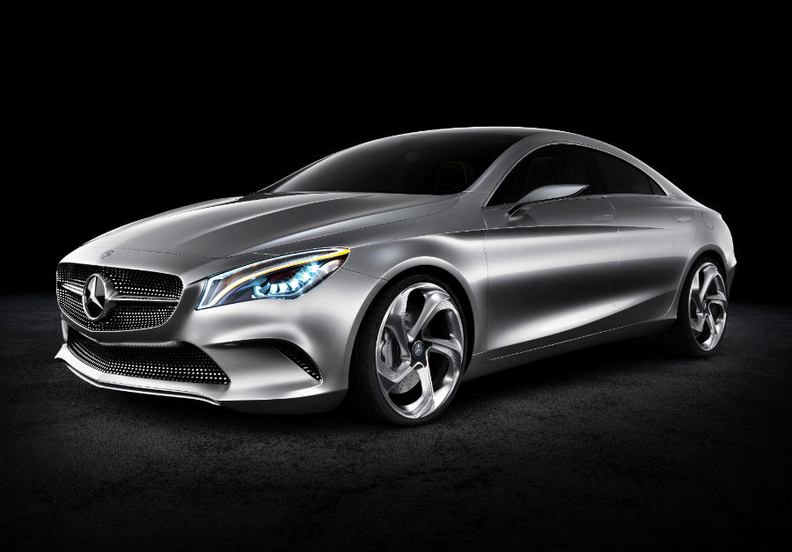 The heavily sculptured Concept Style Coupe highlights Mercedes new dynamic design. A parallel investment at the firm's Rastatt, Germany, factory to build cars off the compact platform will give an estimated annual capacity of 450,000 vehicles, according to data from IHS Automotive. The Concept Style Coupe is expected to undergo mild stylistic changes before the CLA, developed under the code name C117, lands in showrooms. They include the adoption of sturdy B-pillars for added structural integrity, less flamboyant bumpers—particularly at the front—altered headlamp graphics (the Concept Style Coupe's headlamps glow red in standby mode), more conventional exterior mirrors, the same pull-out door handles as those seen on the new A class and smaller wheels and tires than the towering 21-inch items that adorn the show car. Inside, the Concept Style Coupe uses an upgraded interior borrowed from the A class. The same basic appointments will be used on the CLA, albeit in a tone-down form. As with versions of its hatchback sibling equipped with a seven-speed dual-clutch gearbox, Mercedes' latest concept forgoes a traditional center-console-mounted gearlever in favor of a column-mounted shifter. While the production version will receive a five-seat layout, the concept car has a 2+2 seating arrangement, with the individual rear seats divided by a prominent center console. A similar arrangement may be offered as optional equipment on the CLA. The Concept Style Coupe is almost ready for production. Among the CLA's premium-brand four-door rivals will be a sedan version of the third-generation Audi A3 also due out in 2013 and a secret new sedan version of the BMW 1-series that is undergoing conceptual development with a view for introduction in 2015. Also set in its sights is the Volkswagen Jetta, a car that Mercedes-Benz officials suggest they will target heavily in North America and China, markets considered crucial to the CLA's chances of sales success. As a result of the CLA's introduction, the next generation C-class, known internally under the code name W205, is set to retain standard rear-wheel drive and will grow in size, increasing in length and width but retaining much the same height. The new compact range will help Mercedes reduce emissions from cars sold in the European Union from 150g/km now to 125g/km by 2016, according to the automaker. It said the Mercedes A class will start with emissions of 99g/km.